Brighten any crisp fall day with a little glitter and shine. Lately I've been adding quite a bit of metallic tones and glitter to my wardrobe and my life. Shiny style isn't just for bangles and jewelry. This weekend, add some sparkle to your step with some metallic pebbled leather moccasins. They're a perfect match for any ensemble and look fabulous all day long. I'm also drooling over the Metallic Series Mixers that include chrome, brushed nickel, and copper. Can someone please tell Santa that I've been a very good girl this year? Add some shimmer to your manicure with glitter nail lacquer for a fast, easy, and inexpensive way to sparkle. My girls love this idea. Dust little pumpkin, witch, and bat sugar cookies with gold shimmering sugar as a fun alternative to traditional Halloween colors. I've been wanting the Shopper Wristlet for a while and I might just have to take the plunge and get it this weekend. There's space for cards, money, and an iPhone. How do you add sparkle to your wardrobe? 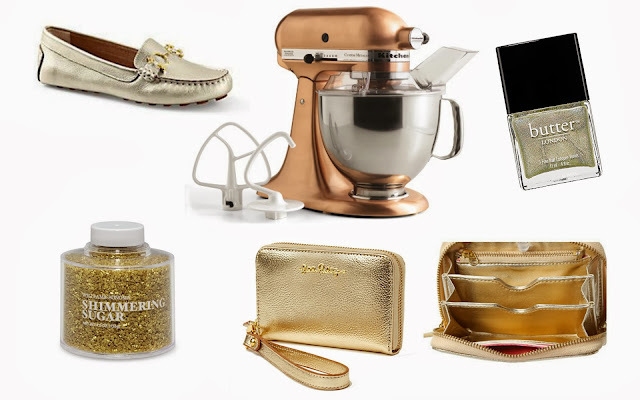 I always enjoy a fun gold clutch for date night!